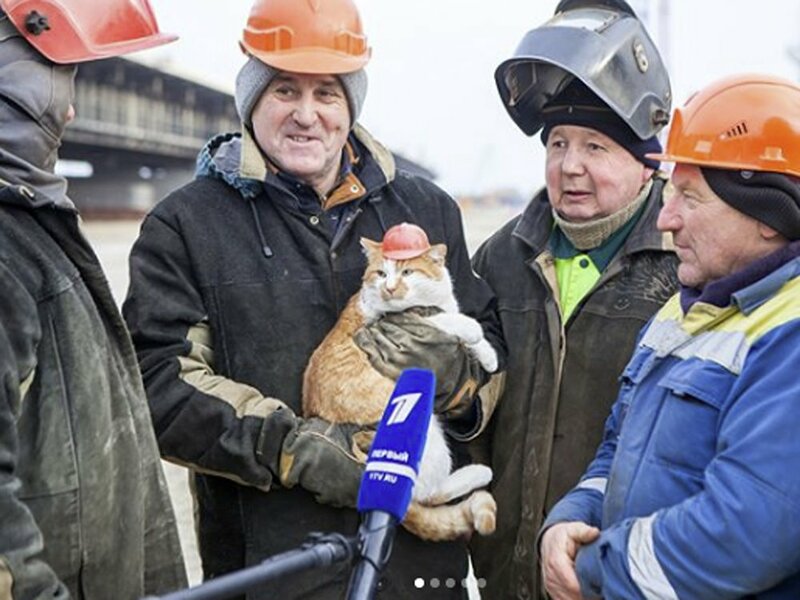 Putin was upstaged by a cat. Hilarious! Ukraine puts more sanctions on Russia, changing foreign currency laws, and expected to nationalize all Russian banks and businesses inside Ukraine. Amb Volker visits Donbass, Surkov backs out of negotiations, Carpenter described this thus: “Surkov was never able to order the FSB or the GRU how to act in the Donbas area, so he just faked the negotiations”. Interesting observations by Karaganov. A significant increase in Russian optempo in Donbass including the bombardment of civilian settlements. More Wagner reinforcements to proxy force. Homeland Defence Minister Avakov launches planning for de-occupation of Donbass, while Col. Girkin has paranoid fears of an AFU offensive to wipe out the proxy force. Russia conducting de facto blockade of Azov Sea ports. 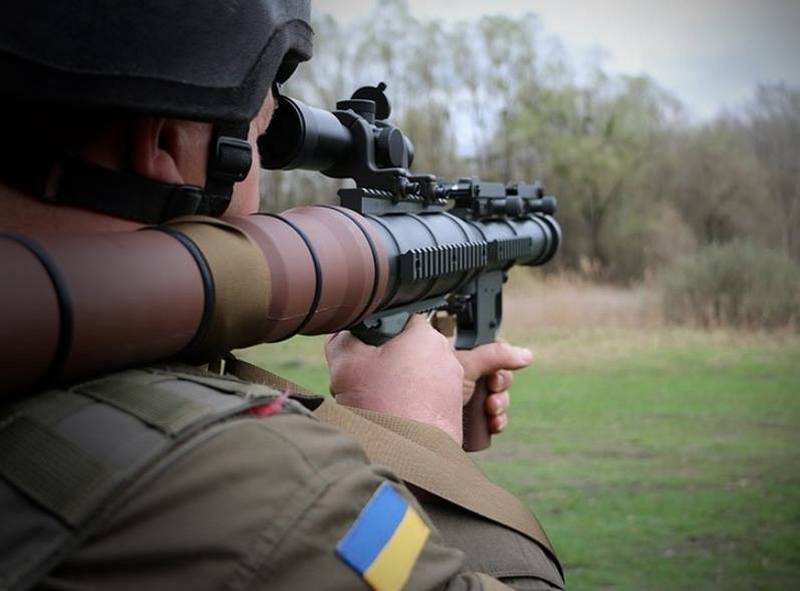 Javelin testing in Ukraine imminent, while NGU takes delivery of US-made PSRL-1 clone RPGs. Miscellaneous political and economic reports, plus some more bizarre statements by Savchenko. SBU raids RIA Novosti and Russia Today offices in Kyiv for conducting infowar against Ukraine, Bureau Chief of RIAN detained and charged with high treason. Russia howls, demonstrating again exceptionalism – Russia has a special right to conduct infowar without hindrance. The sad fate of Ukraine’s military dolphin pod a major media topic in the West. Putin’s stunts opening the Crimean bridge another major media theme, as is the beast who “upstaged Putin”. Multiple reports on Russian brutality in Crimea. Ukraine’s central bank governor says that liberalization of Ukraine’s arcane foreign exchange controls will make it a much more investor-friendly place. This Thursday, the Verkhovna Rada (the parliament of Ukraine) is expected to consider a historic proposal to replace 25-year-old foreign exchange legislation with an entirely new law that will open our country to international investors and make it easier for Ukrainian businesses to operate globally. Technical though it may seem, liberalization of our arcane foreign exchange controls will make Ukraine a much more investor-friendly place and will help the country take its rightful spot amongst the major European and global economies. For nearly four years now, we at the National Bank of Ukraine (NBU) have been working to stabilize the macroeconomic situation and create a solid foundation for economic growth in Ukraine and prosperity for all who live and work here. We have come a long way during that time. My new post-revolutionary team took over the National Bank in 2014, finding ourselves in an incredibly difficult context. Ukraine was not only experiencing military aggression from Russia in the East, but the profound economic turmoil that coincided with it — since, our team at the National Bank have worked tirelessly to stabilize the situation and tame inflation. Ukraine President Petro Poroshenko has signed a decree to enact the recently adopted decision to expand sanctions on Russian companies and entities, according to information published on the presidential website on Friday. A bill to nationalize the property of Russian companies and banks in Ukraine was introduced for consideration by the Verkhovna Rada. The author of the document is People’s Deputy Roman Zvarych from the Petro Poroshenko Bloc faction. The explanatory note for the bill says that such a measure at the legislative level will allow the government to apply sectorial sanctions to Ukrainian legal entities that carry out economic activities jointly with an “aggressor power.” To “promptly and effectively respond to potential threats” on the part of the Russian Federation, it is necessary “to transfer to Ukraine property of the aggressor state or of a legal or natural person that violated the relevant rights and interests of Ukraine and its citizens,” as well as establish liability for violation of legislation on sanction, the document says. Ukrainian President Petro Poroshenko has signed a decree to enact a recently adopted decision to expand sanctions on Russian companies and entities. President of Ukraine Petro Poroshenko has signed a decree on putting into effect the decision of the National Security and Defense Council (NSDC) on the application and cancellation of personal special economic and other restrictive measures (sanctions) to individuals and companies. German Chancellor Angela Merkel has expressed deep concern about repeated violations of a cease-fire between Ukrainian forces and Russia-backed separatists in eastern Ukraine. Russia’s hybrid military forces mounted 60 attacks on Ukrainian army positions in Donbas in the past 24 hours, with seven Ukrainian soldiers reported as wounded in action (WIA). The enemy used mortars in Luhansk and Donetsk regions. A family, including a teenager, was killed in the village of Troyitske, Luhansk region, amid militant shelling with the use of artillery systems at night. Chairman of the Donetsk Military and Civil Administration Pavlo Zhebrivskiy said the woman is in a critical condition in hospital. Russian-led forces mounted 50 attacks on Ukrainian troops in Donbas in the past day, using heavy weapons 19 times. No casualties are reported among the Ukrainian military since the beginning of the day. Russia’s hybrid military forces mounted 66 attacks on Ukrainian army positions in Donbas in the past 24 hours, with two Ukrainian soldiers reported as killed in action (KIA) and another four as wounded in action (WIA). The enemy used mortars and Grad multiple rocket launchers in Luhansk and Donetsk regions. Fierce fighting with Russian-led troops in Donbas, eastern Ukraine, continued on Saturday, May 12, as a result of which one Ukrainian soldier was killed in action, another four were wounded in action. The casualties of the Russian-led forces include one killed and six wounded troops. Ukraine says one of its soldiers has been killed and two wounded in clashes in the country’s east. Chairman of the Donetsk Military and Civil Administration Pavlo Zhebrivskiy has said the Russian-led troops in Donbas shelled a school in the Ukrainian town of Svitlodarsk, Donetsk region, one civilian was wounded in the incident. There are no casualties among teachers and schoolchildren. Units of Ukraine’s Joint Forces have seized enemy weapons near the town of Maryinka in Donbas. Currently, the weapons are being transferred to the area of the Ukrainian troops’ withdrawal. About 100 fighters from Russia’s Private Military Company (PMC) Wagner are to arrive in Russian-occupied Donbas in eastern Ukraine in coming days to support the terrorist organization “Donetsk People’s Republic.” The SBU has held several events for almost a year to brief on the war crimes committed by PMC Wagner in Ukraine. Russia-backed separatists who control the eastern Ukrainian city of Donetsk have unveiled its newest multiple launch rocket systems called the Cheburashka. The Cheburashka (is a character in children’s literature) is a 217mm multiple launch rocket system (MLRS) developed by Ukrainian separatists. According to the Russian media, the new Cheburashka MLRS fitted with two launcher units each able to fire 32 rockets. The main role of the Cheburashka system is to support Russia-backed separatists troops with suppressive fire to counter mortar positions, destroy eliminate enemy nodes of resistance on the immediate battlefield. The rocket launcher pods are mounted on a mobile elevatable launcher platform. The rocket launcher weapon system is mounted at the rear of the KrAZ-260 truck chassis. More : Russia-backed separatists showed improvised 23 mm heavy sniper rifle The MLRS can launch rockets directly from the cab or remotely from outside of the truck cab with a cable. Separatist’s media noted that standard rocket has a maximum firing range of 9600 m (minimal – 1500 m). More : Houthi separatists destroyed Abrams tank used by Saudi troops The Cheburashka can run at a maximum road speed of 80 km/h with a maximum cruising range of 600 km. The Command of the Ukrainian Joint Forces Operation (JFO) in the Donbas requested in a Facebook post that all media and bloggers avoid posting data on tactical movements of the Ukrainian Armed Forces. “The implementation of tasks to improve the tactical position of troops requires thorough efforts to prepare and carry them out,” the statement reads. “As our heroes are doing this difficult and dangerous job, military units of the Joint Forces require certain privacy and confidentiality. A leak of information may result in a defeat and losses among servicemen.” The JFO Headquarters added in their statement: “There is a time for everything, both the liberation of the territory occupied by Russian terrorist troops and the publication of information about the results of our heroes’ work within the Joint Forces.” On April 30, Ukraine’s President Petro Poroshenko officially announced the completion of the Anti-Terrorist Operation and the beginning of the Joint Forces Operation in the Donbas. State Secretary of the Ministry of Internal Affairs of Ukraine Oleksiy Takhtay says Ukrainian Interior Minister Arsen Avakov has launched a campaign for de-occupation of Donbas, eastern Ukraine. It is important at this stage to receive information from international partners and their support, Takhtay said. Former “Defense Minister” of the self-proclaimed “Donetsk People’s Republic” (“DPR”) Igor Girkin, nom de guerre Strelkov, claims everything is ready in the Armed Forces of Ukraine (AFU) to liberate most of the occupied part of Donetsk region. The terrorist says he does not know when the Ukrainian forces may strike, but he is sure “the Ukrainian side has already completed all preparations.”Former “Defense Minister” of the self-proclaimed “Donetsk People’s Republic” (“DPR”) Igor Girkin, nom de guerre Strelkov, claims everything is ready in the Armed Forces of Ukraine (AFU) to liberate most of the occupied part of Donetsk region. Chairman of the People’s Front parliamentary faction, Member of Parliament Maksym Burbak does not rule out that Russia has begun a de-facto blockade of Ukrainian ports of the Sea of Azov. The situation in Donbas, eastern Ukraine, remains tense. Petro Poroshenko, the President of Ukraine plans to participate in the testing of Javelin anti-tank missiles until the end of May. Iryna Lutsenko, the presidential envoy to the Ukrainian parliament claimed this as 112 Ukraine broadcasted. ‘Ukraine’s President plans to participate in the testing of the Javelins at our proving grounds until the end of May 2018’, Lutsenko said. She noted that the provision of the U.S. Javelins to Ukraine confirms the weakening of Russia at the international arena. As it was reported earlier, the U.S. State Department announced the Javelin anti-tank missile system delivery to Ukraine. Ukrainian Interior Minister Arsen Avakov says the National Guard has received the first batch (500 units) of U.S.-made anti-tank grenade launchers PSRL-1. PSRL-1 is effective for hitting firepower and armored targets. Author : Euronews Agency Critics warn that such move would risk greater division in Ukraine and throughout the Orthodox world. The State Food Safety and Consumer Protection Service of Ukraine says the country has obtained the right to export beef to the Turkish market. The harmonization of the veterinary certificate for Ukrainian beef exports to Turkey is at its final stage. Ukrainian nationalists broke through a police cordon to enter the house of opposition lawmaker Serhiy Lyovochkin, a co-owner of Inter TV. The radical activists were angered after a statement against the renaming of streets for World War II-era Ukrainian nationalists was included in a broadcast. Members of a far-right Ukrainian group disrupted an LGBT event in Kyiv on May 10 without Ukrainian police intervening to stop their actions, Amnesty International said in a May 11 statement. Ukrainian Member of Parliament Nadiia Savchenko, who is suspected of plotting terrorist attacks and seizing state power, says she is ready to serve 22 years in Russian prisons in exchange for 60 Kremlin hostages from Ukraine. The MP also said the only weapon she has is a Glock 17 award pistol. Author : Viktor Ruzhynsky Some people think there is no growth of anti-Semitism in Ukraine, and if there are any cases – it is the Kremlin’s intrigues. Actually, even a letter of American congressmen about the situation with anti-Semitism in Poland and Ukraine in our country was assessed as something that was inspired by Russia. The Ministry of Foreign Affairs of Ukraine after this published a harsh statement, in which “strongly rejected any insinuations and accusations that the manifestations of anti-Semitism on the territory of our state were allegedly growing.” True, President Petro Poroshenko personally wrote a post on his Facebook, in which he directly pointed out at the problem: “I strongly condemn any manifestations of intolerance and anti-Semitism. I consider it unacceptable to bring this shameful phenomenon to Ukraine – as it recently took place during the actions in Lviv and Odesa. ” That is, in fact, the president wrote that there is a problem, but the Foreign Ministry is sure that this is all insinuations. At the same time, Poroshenko promises that “the reaction of Ukrainian law enforcement agencies to such illegal actions will be instantaneous.” And the Foreign Ministry is sure that the law enforcement agencies are already “investigating and bringing to justice everyone guilty of such violations.” Our Foreign Ministry notes that according to the Monitoring Group of National Minorities Rights of the Congress of National Communities of Ukraine, no cases of anti-Semitic violence were reported in Ukraine in 2017, and according to the results of the PEW Research Center poll, the level of anti-Semitism in Ukraine is the lowest in Central and Eastern Europe. Ukrainian MP Nadia Savchenko has asked the court to bring her at the meetings with the voters to different cities of Ukraine handcuffed and in the police van as 112 Ukraine broadcasted. During the court session, Savchenko has appealed to the court with a request to bring her from the remand center to the sessions of the Verkhovna Rada. ‘Please, arranged me a transportation from the remand center to the Verkhovna Rada every morning; it can take place with a convoy. Of course, the guards cannot enter the session hall, there are such laws and rules – then wait for me near the doors while I am working in the session hall. Bring me to the committee for a work, National Security and Defense Committee where a lot of cases of the covered corruption take place’, Savchenko claimed. The workers of the Security Service of Ukraine (SBU) and the Prosecutor’s Office of the Autonomous Republic of Crimea has exposed the network of the media entities controlled by the Russian Federation. The law enforcement bodies hold the investigative actions at the office of RIA News-Ukraine as Olena Hitlyanska, the spokeswoman of the SBU reported on Facebook. ‘The law enforcers have established that the media entities were used by the country-aggressor within the hybrid information war against Ukraine. The investigative actions take place’, the message said. The press secretary of the Ukrainian SBU Security Service’s chief, Olena Gitlianska, has said the SBU officers are conducting searches in the office of RIA Novosti Ukraine. Gitlianska said chief of RIA Novosti Ukraine had been detained. Editor-in-Chief of the Russia Today television channel Margarita Simonyan says the officers of the SBU Security Service of Ukraine have blocked the work of the channel’s Kyiv office. Simonyan said Kyiv decided to take revenge for the Crimean bridge. The actions of Kyrylo Vyshynsky, the Head of RIA News-Ukraine were preliminarily qualified as the state treason. Ihor Ponochevny, the Head of Supervision Department for Criminal Proceeding of the Prosecutor’s Office of the Autonomous Republic of Crimea claimed this as 112 Ukraine broadcasted. ‘After the finish of the searches, a decision was made and the issue was solved on the detention of Kyrylo Vyshynsky, the main defendant of this criminal proceeding. The necessary investigative and procedural actions will be held with him such as: assuming measures and so on. At the moment, the preliminary qualification of the crime is the state treason. The things that were brought against him: the medals Vyshynsky got for his subversive actions against Ukraine we found and confiscated’, he said. Chief of RIA Novosti’s Kyiv office Kirill Vyshinsky, who was detained on May 15, has been indicted on charges of high treason. Vyshinsky has a medal “For the Return of Crimea” from Putin. Deputy head of the SBU Security Service of Ukraine Viktor Kononenko says chief of the Kyiv-based office of RIA Novosti Ukraine, Kirill Vyshinsky, who was detained in Kyiv on May 15, was paid EUR 53,000 every month for discrediting the Armed Forces of Ukraine. Vyshinsky is in the Myrotvorets database. Petro Poroshenko, the President of Ukraine, introduced the decision of the National Security and Defense Council of Ukraine on additional measures for the counterwork against Russia’s informational aggression in February. Ukraine will win the media war, as Valentyn Petrov, the Head of Service on Issues of Information Security of the Staff of the National Security and Defense Council of Ukraine, the press-office reports. “Let’s stop sprinkling ashes upon our heads! We are not losing the information war, in fact, we are winning it, and there are many examples. Volunteers, civil society, and the state are doing everything possible for this”, – he stressed. He also noted that “information resources or content should only be banned by a court decision”. Chief of RIA Novosti’s Kyiv office Kirill Vyshinsky, who was detained on May 15 and was indicted on charges of high treason in Ukraine, has admitted in court in Kherson that he has both Russian and Ukrainian passports. Vyshinsky said he wanted to speak Russian in the courtroom. A Ukrainian court has ordered the head of a major Russian state news agency’s branch in Ukraine held for two months on charges of high treason in a case that drew angry criticism from Moscow and expressions of concern from media watchdogs. The head of a major Russian state news agency’s branch in Ukraine has been transferred to the southern region of Kherson for prosecution following his arrest in Kyiv on suspicion of treason. Authorities in Ukraine said Thursday they arrested a senior journalist from a Kremlin-funded news agency who “justified” Crimea’s annexation, “supported” pro-Russian separatists and now faces up to 15 years in jail for treason. Members of Ukraine’s Opposition Bloc party say they are ready to provide guarantees for the release of Chief of RIA Novosti’s Kyiv office Kirill Vyshinsky, who was detained on May 15 and was indicted on charges of high treason in Ukraine. The Kherson City Court in Ukraine’s south ruled on May 17 that Vyshinsky charged with treason should be arrested until July 13 pending an investigation into his case. Ukrainian state security agents searched the offices of Russian state news agency RIA Novosti and detained the director of its Kiev office on Tuesday, accusing RIA of being used in an “information war” by Russia against Ukraine. Relations between Kiev and Moscow nose-dived after Moscow annexed Crimea from Ukraine in 2014 and backed a separatist insurgency in Ukraine’s eastern Donbass region that has killed more than 10,000 people. The military had been using the secretive unit since the ’70s but the bottlenose dolphins were apprehended by Russia when it annexed Crimea in 2014. Ukraine’s military-trained dolphins may have died because the aquatic commandos refused to eat the rations provided by their new handlers after the Russian takeover in Crimea, an official in Kiev said. A Ukrainian representative said the dolphins died after going on a hunger strike. The sea mammals were being trained in a Soviet-era facility in Sevastopol that breeds marine assistants for the navy. Ex-Ukrainian Navy combat dolphins die in the occupied Crimea, refusing to be fed by Russian instructors. Combat dolphins that previously served with Ukraine’s Navy deceased in the annexed Crimea where they were stationed. Borys Babin, Ukraine’s presidential envoy in Crimea said this while on air with 112 Ukraine TV channel. According to him, the mammals who lived and trained at the naval base in Sevastopol, contacted with the Ukrainian military, using special whistles. However, when the Russian instructors received the whistles and the rest of the equipment, the dolphins refused to contact them or even take food from them. Russian President Vladimir Putin has opened the country’s newly built bridge to the annexed Crimean Peninsula, driving a truck across the controversial span. The bridge spans a treacherous strait between the Black and Azov seas, and gives a key link to the Russian mainland. A rail crossing is due to be completed late next year. The Russian leader jumped behind the wheel of an orange dump truck, leading the charge across the 12-mile bridge connecting the two regions for the first time in history. The bridge over the Kerch Strait will be of use for the Russian occupants when they have to leave the Ukrainian peninsula. Petro Poroshenko, the president of Ukraine posted this on Facebook. Poroshenko stated that construction and the opening of the bridge is ‘another case of Russia ignoring the international law’. ‘It’s especially cynical that the bridge is opened shortly before the anniversary of the 1944 deportation of Crimean Tatars, conducted by the Stalinist regime (May 18, 1944 – 112 International)’, he wrote. Russia has defended the construction and opening of a road-and-rail bridge to Crimea this week amid international criticism. In a ceremony broadcast live on state television Tuesday, Russian President Vladimir Putin rode a truck to inaugurate the newly-built bridge connecting mainland Russia to the annexed Crimean peninsula. The U.S. State Department condemned the opening of the $3.6 billion bridge, saying it violates Ukrainian integrity and impedes the navigation of ships into Ukraine from the Sea of Azov. The Russian Federation has responded to the criticism of the United States on the Crimean bridge and said it will not ask for anybody’s permission to build transport infrastructure on the peninsula. The first section of the bridge was launched. Canada condemns the construction and partial opening today of the Kerch Strait Bridge. Russian President Vladimir Putin on Tuesday will mark the opening of the Kerch strait bridge, a construction project that has become a symbol of his 18-year rule. 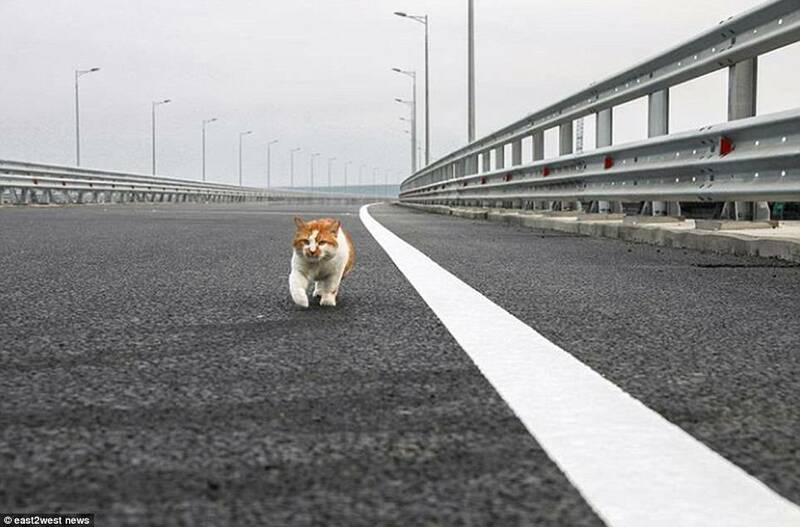 Four years after annexing Crimea, the Russian leader unveiled a bridge to Russia and the builder’s feline mascot has become famous all over the country. A blue and yellow drone playing the Ukrainian anthem was launched in the Russian-occupied city of Simferopol on May 18, on the Day of Remembrance of the Victims of Crimean Tatar Genocide. On May 18, Ukraine marks the Day of Remembrance of the Victims of Crimean Tatar Genocide, as well as the Day of Struggle for the Rights of the Crimean Tatars. Ukrainian President Petro Poroshenko has withdrawn bill No. 8297 on amendments to the Law of Ukraine on Citizenship of Ukraine, which stipulates the stripping of Ukrainian citizenship for voting in Russian-occupied Crimea. Representatives of human rights organizations earlier criticized the presidential bill. Paul Goble Staunton, May 12 – Avraam Shmulyevich says that Moscow is forming Latin American-style “death squads” in occupied Crimea, the Russian Federation and even in some Western countries and that the Kremlin plans to use them to promote the militarization of society, the suppression of dissent, and the defeat of its enemies in the event of a real war. In an interview with Kseniya Kirillova for Radio Liberty, the Israeli expert says “the numerous ‘Cossack cadet corps” Moscow is setting up “do not have any relationship to the real Cossacks … [Instead,] These detachments recall not the Cossacks [of Russian history] but ‘the death squads’ in Latin America” (ru.krymr.com/a/29221535.html). The two post-Soviet Chechen wars showed the Kremlin that “the post-Soviet people does not want to die,” Shmulyevich continues. Indeed, that attitude, many analysts say, is a major reason that has prevented Putin up to now from engaging in even broader forms of aggression abroad at least for the present. But the Kremlin leader has not given up: his regime has come up with the idea to accustom the population to the idea about “the need to fight and die as a chief goal of life” and to begin to inculcate that notion among children. After experience in these militarized units, “these children will now that their main goal is to die for the motherland without thinking.” As developments in occupied Crimea show, Shmulyevich continues, “this work has begun with children. Those youths who today are marching” with unloaded guns “will be going into the army in five to eight years.” And the Kremlin hopes that as a result of their experiences, they will want to fight more than the current younger generation. One reason these militarized activities have been as successful as they have, the Israeli analyst says, is that “all other independent youth subcultures and groups have been chipped away at, discredited and set to fight one another. Only militarized structures remain” which can “attract children with interesting activities, nice uniforms and good organization.” (Shmulyevich notes that Putin’s governor training program also has been militarized with candidates required to jump out of planes and fire weapons, something that would have been unthinkable two decades ago and that businesses dependent on the state are now far more willing to promote militarization than they were earlier.) In brief, the analyst argues, “everything is being done with one main goal in mind: the mass reformation of the psychology of the population of Russia and the creation of a generation prepared to die in war.” According to Shmulyevich, Kirillova writes, young people are being transformed into “’chained dogs of the regime’ in various spheres and this process is especially well advanced and worrisome in Russian-occupied Crimea. Shmulyevich says that “the Russian authorities have cleared declared that for them Crimea is ‘an advanced detachment and the border of our motherland.’ The peninsula is strategically close to the Mediterranean basin and the main communication lines of the West,” especially important if there is a war. Moreover, he continues, “Russian elites have gotten used to the thought that there is nothing terrible in nuclear war and that it is completely possible to make use of tactical nuclear weapons. In a word, they are being prepared for a lengthy war.” The reason Moscow has formed these death squad-like detachments in occupied Crimea, Shmulyevich says, is that they can be used there, shifted to Russia itself, or used in the event of a war. They can suppress dissent on the Ukrainian peninsula, they can attack demonstrators in Russia, and they can become a target in the event of a war. The last feature is especially important for Moscow, he suggests, because in the event of a nuclear response against such forces in Crimea, “the radioactive cloud would not go toward Russia but toward [the rest of] Ukraine.” What is also particularly worrisome, Shmulyevich says, is that “the Kremlin is actively organizing militarized ‘Cossack’ detachments in other countries including Belarus (ru.krymr.com/a/27765937.html), Serbia (facebook.com/radiosvoboda/videos/10155296320137554/) and “even the United States (slavicsac.com/2017/08/25/russian-special-forces-usa/). This process involved “the ideological processing of people and the creation out of them of a certain ‘fifth column,’” Shmulyevich says. “Moscow thus is creating a kind of ‘cadres reserve which then could be used for whatever it wants, beginning with intelligence and ending with various demonstrations in support of Russia or definite politicians.” And “if a serious war should begin, it is not excluded that part of these people will be used for diversionary actions,” Shmulyevich says. The phenomenon Shmulyevich points to is disturbing; and even though most of those swept up in Putin’s militarization program won’t end up in the kind of “death squads” the Israeli analyst suggests, some of them likely have and more may in the future, a dangerous trend that bears the closest possible monitoring.